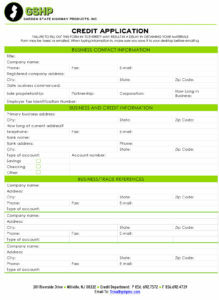 Please have billing and shipping company name, street address (do not use P.O. Box for shipping address), city, state, zip code, telephone number and “Attention to” (if applicable) ready when ordering. The information will ensure fast, accurate processing of your order. See next page. Orders for Non-Standard Signs and Street Name Signs must be submitted in writing in order to eliminate possible errors as a result of telephone conversations. Restocking charge on stock items is $25.00 or 20% of the order, whichever is greater. Garden State Highway Products, Inc. (GSHP) guarantees all of its products to be free from defects in materials and workmanship at time of delivery. We will repair or replace, at our discretion, any product whose defect can be directly attributed to failure of either our materials or workmanship. Copy, finish, material and color choice as well as local, state, federal and corporate regulations concerning the suitability, legality, and/or safe use of any product purchased from Garden State Highway Products, Inc. are the sole responsibility of the customer. When ordering standard catalog items, please specify quantity, catalog number (if possible), size, color (if there is a choice), and accessories (if applicable). When ordering non-standard or non-stock items, you may have to purchase in full-box quantities per manufacturer’s minimum requirements. No merchandise may be returned without Garden State Highway Products, Inc’s approval. All custom orders are non-returnable. Goods returned without authorization will be returned at the sender’s expense. Should a return be authorized, the merchandise must be carefully packaged to ensure it reaches us in re-sellable condition. Credit cannot be given for merchandise returned in a damaged condition due to improper packaging. All claims for shortages or damaged goods must be filed with the delivering carrier within five (5) business days after receipt of goods. Keep all cartons and labels. Please do not deduct claims for loss or damage or transportation charges resulting therefrom from our invoice. If any discrepancies are found, note them in writing on both yours and the carrier’s delivery tickets. Be sure the driver signs both copies acknowledging the discrepancy and notify us immediately. Hidden Damage: Should you discover any damage after delivery, you should contact the delivering carrier immediately and request that an inspection report be completed by the carrier. 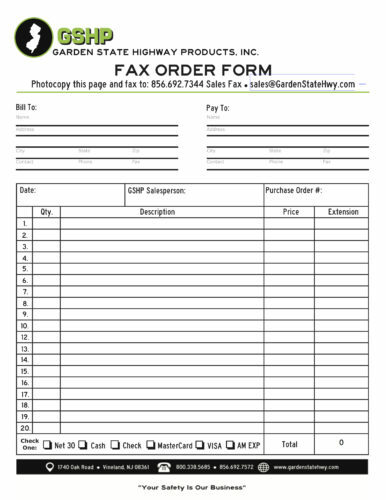 Terms of payment: Standard terms are net 30 days from date of invoice; subject to credit approval by Garden State Highway Products, Inc. past due invoices subject to 1.5% monthly interest charge. Orders received from past due accounts will not be processed until the account is current. Prices are subject to change without notice. Minimum order is $50.00. Shipping: All terms FOB factory unless otherwise noted in this catalog or quoted in writing. We accept Visa, Mastercard, and American Express for your convenience. NOTE: Please add a 5% transaction fee for all credit card orders. We look forward to working with you. Thank you for contacting us.